BlackMagic Design has announced the latest version of its editing, grading, digital audio DaVinci Resolve 15. It now has full Fusion visual effects and motion graphics built in! DaVinci Resolve 15 features an entirely new Fusion page for feature film quality visual effects and motion graphics animation. Fusion was previously only available as a stand alone application and is the world’s most advanced visual effects and motion graphics software. It is now built into DaVinci Resolve 15. The new Fusion page gives customers a true 3D workspace with over 250 tools for compositing, vector paint, particles, keying, rotoscoping, text animation, tracking, stabilization and more. Adding Fusion to DaVinci Resolve has been a massive project that will be completed over the next 12-18 months. Customers can get started using Fusion today to complete nearly all of their visual effects and motion graphics work. The standalone version of Fusion will continue to be available for customers who need it. DaVinci Resolve 15 also features a huge update to the Fairlight audio page. The Fairlight page now has a complete ADR toolset, static and variable audio retiming with pitch correction, audio normalization, 3D panners, audio and video scrollers, a fixed playhead with scrolling timeline, shared sound libraries, support for legacy Fairlight projects, and built in cross platform plugins such as reverb, hum removal, vocal channel and de-esser. With DaVinci Resolve 15, customers no longer have to worry about audio plugins when moving between Mac, Windows and Linux because the FairlightFX plugins run natively on all three platforms. DaVinci Resolve is the fastest growing nonlinear video editor in the industry. It’s also Hollywood’s favorite color corrector. Blackmagic Design has listened carefully to feedback from professional colorists and editors. DaVinci Resolve 15 includes over a hundred new features and improvements that editors and colorists have asked for. Colorists get an entirely new LUT browser for quickly previewing and applying LUTs, along with new shared nodes that are linked so when one is changed they all change, multiple playheads for quickly referencing different shots in a program, over 5x performance improvement for stabilization, improved noise reduction, and new Super Scale HD to 8K up-rezzing. DaVinci Resolve 15 also expands HDR support with GPU accelerated Dolby Vision metadata analysis and native HDR 10+ grading controls. In addition, new ResolveFX let customers quickly patch blemishes or remove unwanted elements in a shot using smart fill technology. There are also new ResolveFX for dust and scratch removal, lens and aperture diffraction effects, and more. Professional editors will find new features in DaVinci Resolve 15 specifically designed to make cutting, trimming, organizing and working with large projects even better. DaVinci Resolve 15 has dramatically improved load times so that large projects with hundreds of timelines and thousands of clips now open instantly. New stacked timelines and timeline tabs let editors see multiple timelines at once so they can quickly cut, paste, copy and compare scenes between timelines. There are also new markers with on-screen annotations, subtitle and closed captioning tools, auto save with versioning, greatly improved keyboard customization tools, new 2D and 3D Fusion title templates, image stabilization on the Edit page, a floating timecode window, improved organization and metadata tools, Netflix render presets with IMF support and much more. In addition, Blackmagic Design also introduced new Fairlight audio consoles for audio post production that will be available later this year. The new Fairlight consoles are available in 2, 3 and 5 bay configurations. Prices for the new Fairlight control panels are approximately 80% less than the previously available panels with prices ranging from US$21,995 to US$48,995. The public beta of DaVinci Resolve 15 is available today as a free download from the Blackmagic Design website for all current DaVinci Resolve and DaVinci Resolve Studio customers. 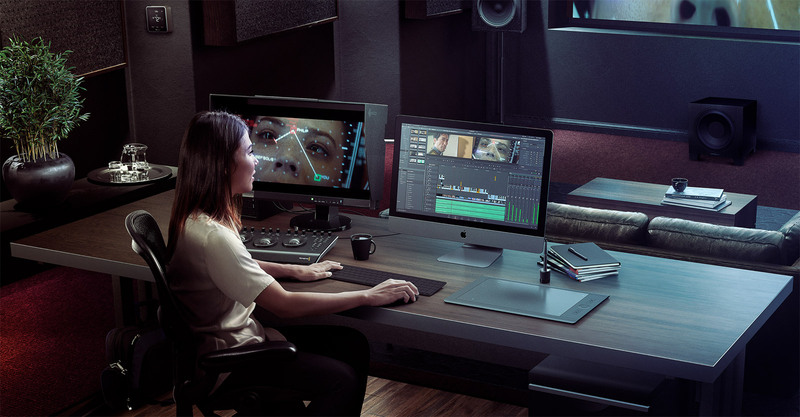 DaVinci Resolve Studio is available for US$299 from Blackmagic Design resellers worldwide. The Fairlight consoles will be available later this year and will be priced from US$21,995 for the Fairlight 2 Bay console. The Fairlight consoles will be available from Blackmagic Design Resellers worldwide.